Jetway HPC150GR-HD1900B heavy-duty Fanless Panel PC offers complete robust solution for harsh industrial environments, such as cloud computing, IoT solution, transportation, heavy-vehicles, intelligent building, oil pipe monitoring systems, environmental monitoring, steel refineries, machine control and factory automation. 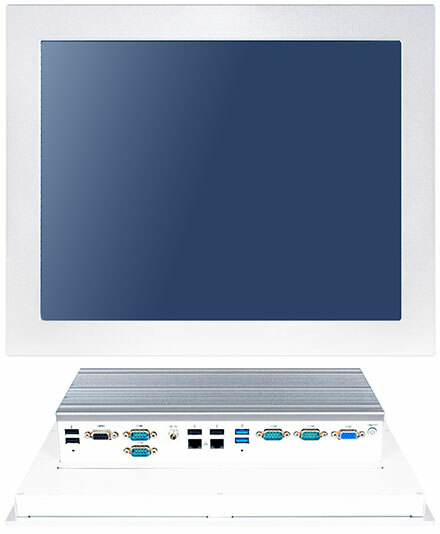 Jetway HPC150GR-HD1900B heavy-duty Fanless Panel PC is designed with 5-wires resistive touch screen for 4:3 size panel. High brightness TFT LCD panel with LED backlight are equipped with all models. Cable-free design is easy for the HDD and memory installation. Streamlined enclosure with strong solid aluminum frame design, it provides good heat dissipation and achieve fanless cooling system. Jetway HPC150GR-HD1900B heavy-duty Panel PC is also designed for open frame application. Heavy-duty Panel PC is designed mounting clips for easy Wall mount, Panel Mount, VESA Mount installation. It is a true flat with easy clean design, front bezel meets IP65-rated & NEMA 4 protection. Welcome to use Jetway heavy-duty Panel PC. Watchdog Timer – 256 levels, 0~255 sec.